Friendly staff and good service! I'd book it again! I loved this hostel! I am a single woman traveling and I felt very safe. I will absolutely book this place again! 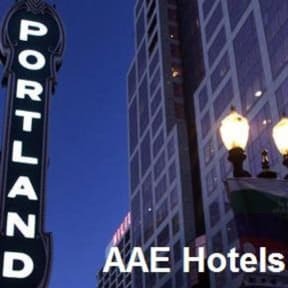 I loved my stay at AAE Portland. Very friendly staff. I had a single private room. Microwave, mini-fridge, flat-screen TV with cable. Everything I needed. The grocery stores nearby were expensive. I drove to Target; $30 for 4 days of food. My room overlooked the streetcar tracks. Especially at night they were noisy. I happen to sleep very soundly so never awoke though. Liked the East Indian decor and especially the rose bushes planted outside along the bldg. Perfect stay. I stayed there when I was looking for an apartment to move down from Seattle. The staff were very courteous and friendly. I would certainly stay there again, if I needed to. Location is the best! Staff is nice and helpful. Have absolutely now clue where the front photo was taken, it looks like some social area with a bar. There is one medium-sized room (within a musty hall) with about 8 bunks. Place has an old feel. There is an enclosed patio which is kinda nice. This hostel and the website have a major disconnect. DO NOT BOOK THIS PLACE IF YOU ARE 30 YEARS OLD OR OLDER. THIS IS NOT AN HOSTEL It's a shared room in a motel The heater is loud and not working well. There are no cookers. They are building a skyscraper just infron: VERY NOISY. The community area is inside the room and there are no table and chairs. I was met at the front desk with aggravated tone as I was unsure of my booking source. As I found my confirmation email I was lectured on importance of this. With no noted policy on the web at reservation time I was surprized I could be turned away due to age, talked to with high level of disrespect, and required to pay a deposit. . .When I alerted the company hostel world they lived up to the name and kept the deposit. Bewaire. With all my luggage, after the tiring trip, and spending time, money & effort to get to the hostel, I was supposed to feel relieved, but got rejected because of my age! I am in my 30's! Can you imagine being discriminated and not having a place to stay in a strange city? After turning me down, the receptionist is not even empathetic & helpful. The name displayed at the front of the building says a totally different name too which is confusing. Also, the place stinks like an indian kitchen.